If being the central character to the world's most famous and most successful film franchise is not enough, Ian Fleming's creation can lay claim to one other pop culture icon - the vodka martini. Now popular in bars throughout the Western world, and more so following the 2006 big screen adaptation of "Casino Royale" when 007 invents the drink, the vodka martini is as synonymous with 007 as the Walther PPK, the Aston Martin DB5 or the sight of a beautiful girl hanging off his gun arm. 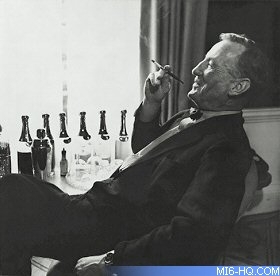 Above: "Casino Royale" author Ian Fleming was as notorious for his strong tastes as his creation James Bond. Above: The comic strip adaptation of the scene stayed true to Fleming's recipe. He explained about the special martini he had invented and his search for a name for it. 'The Vesper,' he said. The concept of "bruising the gin" as a result of shaking a martini is an oft-debated topic. The term comes from an older argument over whether or not to bruise the mint in preparing a Mint Julep. A shaken martini is different from stirred for a few reasons. The shaking action breaks up the ice and adds more water, slightly weakening the drink but also altering the taste. Some would say the shaken martini has a "more rounded" taste. Others, usually citing hard-to-track-down scientific studies, say that shaking causes more of a certain class of molecules (aldehydes) to bond with oxygen, resulting in a "sharper" taste. Shaking also adds tiny air bubbles, which can lead to a cloudy drink instead of clear. In addition the drink is a perfect aperitif - it cleanses the mouth before eating - and the tiny air bubbles restrict the gin (or vodka) from reaching all tastebuds. This is why purists would claim that a martini should always be stirred. Some martini devotees believe the vermouth is more evenly distributed by shaking, which can alter the flavour and texture of the beverage as well. 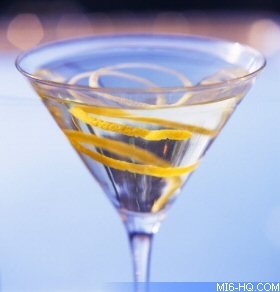 In some places, a shaken martini is referred to as a "Martini James Bond".